CEwire2017 Early Registration is now open! $149 / 40 COPE-approved credits. I’m thrilled to announce that early registration for CEwire2017 is now open. The show will be online LIVE January 28 & 29, 2017. If you can’t make it live, you can still participate by watching the lectures on-demand. They’ll be available through May 1st. You’ll also be able to visit the virtual exhibit hall to get exclusive discounts from leading vendors. 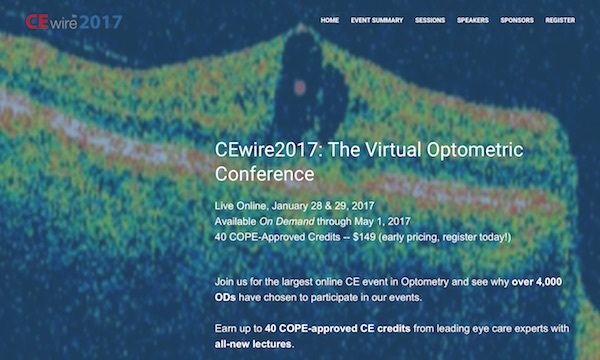 … And tune in to the CEwire2017 Livestream, where we’ll chat with optometric thought leaders and eye care industry executives. Over 4,000 ODs have attended our CEwire events; we hope to see you this January!